The price of barley is linked to the Safex price of B1 grade wheat and is calculated at 97% of this price as a guideline. Wheat futures are about R3,808/ton which implies a barley price of about R3,694 for a malting barley. The many barley grading regulations are quite stringent to be able to pass as an acceptable malting grade. It is important that your production of barley must take into consideration any of the crop management factors which make this crop quite ‘tricky’ to produce to achieve a high grade of seed. The crop can be quite easily downgraded to ‘feed’ grade. The production of barley compared to wheat must take into consideration the yield targets obtainable whether in dryland or irrigated production as well as the complexities or ease of managing the crop husbandry required with each crop. Yields of barley vary from 3,2 t/ha to 4,0 t/ha for dryland production within a crop rotation cycle and 6,5 t/ha to 7,0 t/ha for production under centre pivot irrigation. Irrigated wheat can yield up to 10,0 t/ha. The extra fertilisation, seed and other costs for wheat production must be considered when deciding which grain is the most profitable to produce. On an equal yield basis, barley production costs are about 80% of wheat production costs. You will know the possible yields achievable for these crops in your area under various production conditions. The management of barley production under dryland or irrigated conditions is very similar to that of wheat. Some differences and factors to consider in malting barley production are highlighted below. Barley is not susceptible to fusarium head blight and so can be used as an alternative crop to wheat where this disease has become a problem in your lands. Barley can thus be used within a planned crop rotation programme to great advantage. If the vegetative growth of stems is promoted with too many applications of nitrogen the tendency for tall barley plants to lodge or blow over in windy condition when the seed heads are mature is increased. Too much nitrogen applied during the growth stages can result in the nitrogen content of the seed test being over the stipulated amounts and will thus influence the final grading and thus the price received for the crop. 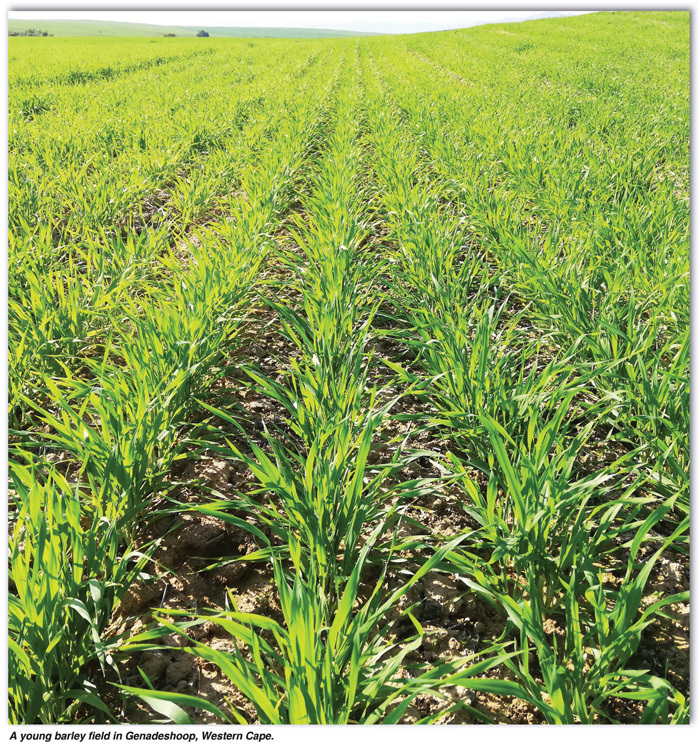 Barley cultivars, under irrigation, used in the past were fertilised with only 30 kg/ha to 40 kg/ha of nitrogen compared to the 250 kg/ha for wheat applied in 4 - 5 tranches in the growing period. More modern cultivars and current management experience shows that 130 kg/ha to 140 kg/ha could be required. Top dressing is usually done 65 days after emergence to prevent too high a nitrogen content in the seed test. As a farmer your own experience and local production knowledge will help you decide what level of application is best under your circumstances. Dryland producers might apply 80 kg of nitrogen as a top dressing using urea as the nutrient agent. Lodging can reduce the final yield in a land from a possible 7 t/ha by 2 to 3 tons. This is a huge loss of income. Nitrogen applications must be very carefully planned and executed. As in wheat production the soil profile must be at field capacity at planting and continuous controlled applications of water must be applied. One cannot afford any problem with pumping, pivot nozzles or electrical connections or failure during the short growth cycle. In areas where strong winds can blow over plants with heavy wet heads after irrigation the pivots should be switched off whether in the day or the night. It is essential to have your harvesting equipment ready so that the crop can be reaped to ensure the best seed quality. The barley growth period from planting to harvesting is usually about two weeks faster than wheat and must be carefully monitored. In dryland production the crop must be swathed just before final maturity to prevent seed loss and then the windrows combined at the optimum stage thereafter. Swathing takes place when the seed heads have lost the colour and are below 30% moisture content. The downgrading of the crop to feed grade must be avoided at all costs. It is highly recommended that any barley producer downloads or read all the technical resources and latest information on the correct cultivars to use from the SABB website. 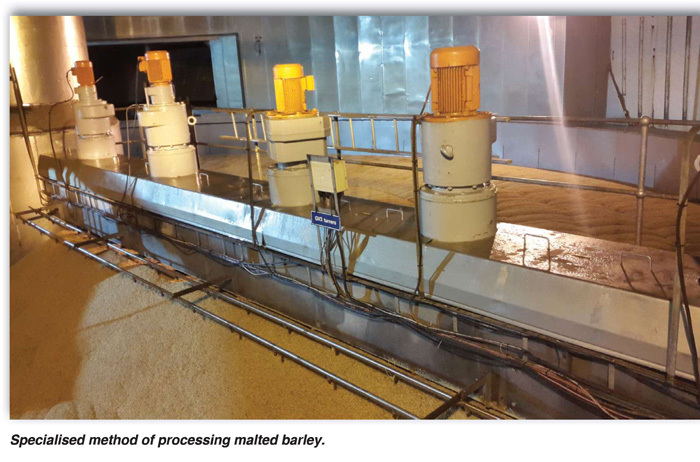 The best production methods to ensure the best quality of seed possible for malting are described in depth and detail. Yields can vary by a ton or more per hectare. Cultivar choice is very important. All the parameters governing the assessment of seed for quality can be found by accessing the SABB and South African breweries websites. Each farmer should also join the SAB’s ‘Better Barley Better Beer’ initiative to be aware of every production factor that can be monitored and controlled to ensure that the best possible seed for malting is harvested.